The Portable Chlorine Dioxide Gas Decontamination Chamber is an easily transportable, sealed chamber designed for use in any governmental, pharmaceutical, manufacturing, laboratory, research or surgical setting. It offers the ability to decontaminate small and medium sized equipment and components inside a portable unit rather than in an entire room or a large fixed chamber. The portable decontamination chamber is used in conjunction with a chlorine dioxide generator to provide a rapid and highly effective method of sterilization and transport items under aseptic conditions to a different part of your facility. It also offers a way to sterilize components within the room where they are kept to minimize the chance for cross-contamination. The CD generation equipment is also easily portable and features a sophisticated sterilant concentration monitoring system to assure a tightly controlled sterilization process that is easy to validate due to the repeatable cycle. 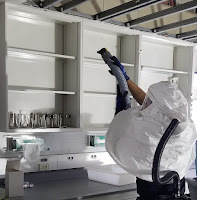 The portable decontamination chamber contains removable shelving inside to handle multiple or large components such as computers, electronics, medical devices, sterile products, and instruments. The chamber has HEPA filtered air intakes to keep components sterile after decontamination. It can connect to your facility’s exhaust system for direct aeration or utilize an integrated carbon scrubber to remove the gas from the chamber. Custom sizing is available to fit the facility’s needs. Decontamination time can be under 90 minutes for a 63 ft3 (1.8 m3) chamber and costs under $7 in consumables per cycle. To learn more, visit our product page or request a portable decontamination chamber quote.